Now my forthcoming book Milestones of Motherhood is one step closer to its 2019 publication, I’m excited to spend some time reviewing some powerful and transformative books which inspire growth, learning and transformation into embodying more of our Feminine truth, wisdom and power. Yoni Shakti is a powerful invitation to re-discover Yoga from a new, woman-centred perspective. Uma presents a feminist critique of the history of yoga, explaining that traditionally Yoga practice tended to be set out by a male teacher or lineage, and as students women learned how to fit their bodies around these practices. Much emphasis tended to be on developing physical attributes and achieving ‘good’ postures. Women may develop strength and focus, yet such practices can be depleting, and less useful for women during the intense female experiences of pregnancy, mothering, breastfeeding, menstruation and menopause. Building on decades of Yoga teaching, training and practice, Uma has created Womb Yoga; a collection of practices and philosophies which honour, nourish and respect the rhythms and cycles of women’s bodies. 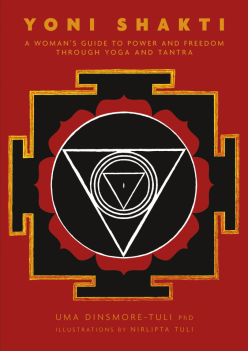 Yoni Shakti is a comprehensive and life-long guide for women seeking to understand how yoga can lead to living a conscious and connected life. Detailed sections explore the application of yoga in every aspect of womanhood, including menarche (the onset of menstruation), menstruation, fertility, sexuality, creativity, pregnancy, birth, breastfeeding and post natal recovery, mothering, perimenopause, menopause and the wisdom of the crone. This is a Yogic guide for every stage of the Feminine journey. The yoga guidance is detailed and faultless, always inviting you to explore and experience the postures and practices for yourself. One of the many things I love about Yoni Shakti is the way Uma takes the time to explain the hows and whys of each practice which enables students and teachers of all levels of experience to engage in the practices with great awareness of why they are doing this and what it has the potential to bring to their lives. This is the book the female yoga community of today has been waiting for for many years. It is a Yoga which acknowledges, validates, respects and welcomes all of our experiences and manifestations of our Femininity; however we are is okay, and Uma provides philosophy and practice to nurture and support our experiences. Yoni Shakti is essential reading for all of those working holistically with women, for yoga teachers, pregnancy and post-natal teachers, doulas and all women interested in seeking connection and learning to live in tune with their own bodies and cycles throughout their lives. The yoga practices are inspiring and accessible for women interested in beginning yoga as well as those with an established practice. The way Uma links each stage of Femininity to the Hindu Goddesses is inspiring and beautiful, really bringing through the different feelings and energies of our Feminine journeys and providing detailed insight into Yogic philosophy and its relevance to our live today. Yoga is often described as the science of life, yet I would describe Yoni Shakti as a companion for life; the yoga offered here is faithful, committed and supportive through every aspect of womanhood. Yoni Shakti makes for essential reading for every woman who seeks to live a fulfilled, connected and powerful life. Having trained in Women’s Wellness Yoga Therapy with Uma, Yoni Shakti provides an invaluable resource of reference, further research and is an excellent manual for Women’s Wellness Womb Yoga practice and class planning. Once in as while a book comes along which will powerfully transform and enrich your whole life. These practices have the potential to bring you to the heart of what yoga truly can be, and may change your life many times over. Enjoy! A version of this review originally featured in The Mother Magazine.